Randy Halverson is a photographer who makes stunning time lapse videos of the night sky (like Tempest Milky Way and Plains Milky Way; seriously, if you haven’t seen those, go watch them now). He’s currently in the process of making a new video, and in one of the frames he happened to catch a bright meteor, a bit of cosmic fluff burning up as it rammed through our atmosphere. What’s neat about this particular incident is that the meteor left behind a glowing streak that lasted for over half an hour! Technically, that’s called a persistent train, and it’s not actually smoke. As a meteoroid (the actual solid chunk of material) blasts through the air, it ionizes the gases, stripping electrons from their parent atoms. As the electrons slowly recombine with the atoms, they emit light — this is how neon signs glow, as well as giant star-forming nebulae in space. The upper-level winds blowing that high (upwards of 100 km/60 miles) create the twisting, fantastic shapes in the train. The actual details of how this works in meteor trains are not well understood, mainly because they are so difficult to spot and study. It’s hard to point a telescope at a position in the sky when you don’t know where or when a meteor will pass through! Here’s the frame of the time lapse Randy took that shows the meteor as it burned up (again, click to embiggen). Note that in the hi-res shot you can already see the train; that formed after the meteor was gone, but in this time exposure you can see both simultaneously. I’ll note it’s not really friction that causes a meteor to burn up. Most of the heating is due to the meteoroid’s hypersonic passage through air, which compresses the gas, heating it up violently. The heat melts the rock (or metal) in the meteoroid, which then blows off, leaving behind a train that fades rapidly. But the glow from the ionized gas takes much longer to decay, leaving the persistent train. Very cool, and very pretty. I can’t wait to see the video when Randy’s done with it! 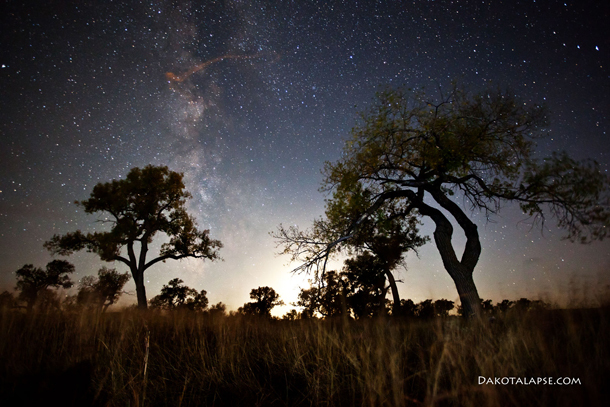 Image credit: Randy Halverson, from his site DakotaLapse, used with permission. You can follow Randy on Google+ as well. – The fiery descent of Atlantis… seen from space!